We recognise the trust our investors place in us and it's not a responsibility we take lightly. Fisher & Paykel Healthcare Corporation Limited attaches a copy of its presentation to analysts and fund managers at the Deutsche / Craigs NZ Corporate Day in Sydney. FPH announced today that settlement of the global patent infringement litigation with ResMed will not have a material impact on its net profit after tax guidance for the 2019 financial year. ResMed and Fisher & Paykel Healthcare today announced an agreement to settle all outstanding patent infringement disputes between the companies. Fisher & Paykel Healthcare Corporation Limited today announced its results for the half year ended 30 September 2018. Net profit after tax was NZ$97.4 million, up 20%. Fisher & Paykel Healthcare advises that Neville Mitchell has been appointed as a non-executive director of the company. Fisher & Paykel Healthcare announced today that it intends to release its half year results for the 2019 financial year on Monday, 26 November 2018. Fisher & Paykel Healthcare Corporation Limited announced today that the Munich Regional Court has found the headgear for two of its masks used in the treatment of obstructive sleep apnea (OSA) infringed a patent held by ResMed. Fisher & Paykel Healthcare announced today that it has filed a complaint with the US ITC. FPH announced today that it will contest patent allegations made against it by ResMed in the ITC and US District Court for the Southern District of California. Fisher & Paykel Healthcare Corporation Limited (NZX:FPH, ASX:FPH) advises that all resolutions put to the company’s annual shareholders’ meeting held in Auckland today were passed. Fisher & Paykel Healthcare Corporation Limited announced that it has upgraded its earnings guidance for the financial year ending 31 March 2019 at its Annual Shareholders’ Meeting today. Fisher & Paykel Healthcare Corporation Limited has provided a copy of its Notice of Annual Shareholders' Meeting 2018 which will be held on Thursday, 23 August 2018. Fisher & Paykel Healthcare Corporation Limited announced today that it has selected Claudia Wyss to participate in the Future Directors programme. Fisher & Paykel Healthcare Corporation Limited advises that its 2018 Annual Shareholders’ Meeting will be held on Thursday 23 August 2018. Fisher & Paykel Healthcare Corporation Limited today reported record net profit after tax of NZ$190.2 million for the year ended 31 March 2018, an increase of 12% over the previous year. New research has been published in the International Journal of COPD which demonstrates significant benefits of nasal high flow therapy for COPD patients using the myAirvo device. Fisher & Paykel Healthcare intends to release on Monday, 28 May 2018 its financial results for the year ended 31 March 2018. New research shows significant benefits of Optiflow™ nasal high flow therapy for pediatric patients requiring respiratory support. Fisher & Paykel Healthcare Corporation Limited today announced that Chief Financial Officer, Tony Barclay, will retire at the end of May 2018. Presentation to the New Zealand Shareholders' Association in Auckland on 13 February 2018. Fisher & Paykel Healthcare announced today that it has signed a building construction contract with Leighs Construction for the fourth building on its Auckland campus. The strike price for the dividend reinvestment plan (DRP) operating in respect of the dividend payable on Wednesday 20 December 2017 has been set at NZ$13.3583 per share. Fisher & Paykel Healthcare announced today that it has filed a patent infringement proceeding in the Federal Court of Australia against ResMed Ltd and several of its related companies. Fisher & Paykel Healthcare today announced its results for the half year ended 30 September 2017. Net profit after tax was NZ$81.3 million, up 4% from the prior comparable period. Fisher & Paykel Healthcare Corporation Limited has today announced a UK Court ruling that a patent asserted against it by ResMed is invalid. Fisher & Paykel Healthcare has today published its Corporate Responsibility and Sustainability Report for the financial year 1 April 2016 to 31 March 2017. The company announced today that it intends to release on Tuesday, 21 November 2017 its financial results for the six months ended 30 September 2017. Fisher & Paykel Healthcare Corporation Limited attaches a copy of its presentation to analysts and investors at its investor day in Sydney. Fisher & Paykel Healthcare Corporation Limited today provided a further update on its patent litigation with ResMed in Europe. FPH announced today that it has been successful in having two patent proceedings suspended. Fisher & Paykel Healthcare Corporation Limited advises that all resolutions put to the company’s annual shareholders’ meeting held in Auckland today were passed. Fisher & Paykel Healthcare Corporation Limited announces that it has updated its earnings guidance for the financial year ending 31 March 2018. Fisher & Paykel Healthcare Corporation Limited has provided a copy of its Notice of Annual Shareholders’ Meeting 2017 which will be held on Thursday 24 August 2017. Fisher & Paykel Healthcare Corporation Limited advises that its 2017 Annual Shareholders' Meeting will be held on Thursday 24 August 2017. Pip Greenwood has been appointed as a non-executive director of Fisher & Paykel Healthcare with effect from 1 June 2017. Fisher & Paykel Healthcare Corporation Limited today reported record net profit after tax of NZ$169.2 million for the year ended 31 March 2017, an increase of 18% over the previous year. Fisher & Paykel Healthcare Corporation Limited announced today the release of F&P SleepStyle™, a CPAP device used in the treatment of obstructive sleep apnea (OSA). Fisher & Paykel Healthcare announced today that ResMed has filed a motion with the US ITC to terminate the current investigation. Fisher & Paykel Healthcare Corporation Limited announced today the introduction of F&P Optiflow Junior 2. Fisher & Paykel Healthcare Corporation Limited announced today that it intends to release on Monday, 22 May 2017 its financial results for the year ended 31 March 2017. Fisher & Paykel Healthcare Corporation Limited attaches a copy of its presentation to analysts and fund managers at the Deutsche Bank NZ Corporate Day Conference in Sydney. The strike price for the dividend reinvestment plan (DRP) operating in respect of the dividend payable on Wednesday 21 December 2016 has been set at NZ$8.2541 per share. Fisher & Paykel Healthcare Corporation Limited announced today that the District Court in Munich has overturned both preliminary injunctions previously granted to ResMed, Inc.
Fisher & Paykel Healthcare Corporation Limited today announced its results for the half year ended 30 September 2016. Net profit after tax was up 26% for the half at a record NZ$78.2 million. Fisher & Paykel Healthcare has today published its Corporate Responsibility and Sustainability Report for the financial year 1 April 2015 to 31 March 2016. Fisher & Paykel Healthcare Corporation Limited announced today that it intends to release on Tuesday, 22 November 2016 its financial results for the six months ended 30 September 2016. Fisher & Paykel Healthcare Corporation Limited (NZX:FPH, ASX:FPH) announced today that it has selected Rachael Newsome to participate in the Future Directors programme. Fisher & Paykel Healthcare Corporation Limited attaches a copy of its presentation to analysts and investors at its investor day in Mexico and the United States. Fisher & Paykel Healthcare Corporation Limited attaches a copy of its presentation to investors in Hong Kong, London and New York. Fisher & Paykel Healthcare Corporation Limited announced today that it has updated its earnings guidance for the financial year ending 31 March 2017, and commenced a new building programme in New Zealand and Mexico. Fisher & Paykel Healthcare Corporation Limited announced today the introduction of the F&P Nivairo™, a hospital mask for non-invasive ventilation therapy. Fisher & Paykel Healthcare Corporation Limited announced today the introduction of an innovative new mask, the F&P Brevida™. Fisher & Paykel Healthcare Corporation Limited announced today that it intends to vigorously defend the recent allegations of patent infringement and declaratory judgment claims made by ResMed, Inc.
Fisher & Paykel Healthcare Corporation Limited announced today the introduction of an innovative new product, the F&P 950 Heated Humidification System. Fisher & Paykel Healthcare Corporation Limited announced today that it has filed patent infringement proceedings in the US District Court for the Central District of California. Fisher & Paykel Healthcare Corporation Limited has provided a copy of its Notice of Annual Shareholders’ Meeting 2016 to be held on Tuesday 23 August 2016. Fisher & Paykel Healthcare Corporation Limited advises that its 2016 Annual Shareholders’ Meeting will be held on Tuesday 23 August 2016. Fisher & Paykel Healthcare Corporation Limited advises that the strike price for the dividend reinvestment plan (DRP) operating in respect of the dividend payable on Friday 8 July 2016 has been set at NZ$10.3266 per share. Fisher & Paykel Healthcare Corporation Limited has changed its admission category on the ASX to ASX Foreign Exempt Listing, effective from 20 June. Fisher & Paykel Healthcare Corporation Limited today reported record net profit after tax of NZ$143.4 million for the year ended 31 March 2016, an increase of 27% over the prior year. Fisher & Paykel Healthcare Corporation Limited today announced record net profit after tax of NZ$62.0 million for the half year ended 30 September 2015, an increase of 27% over the first half last year. Operating revenue was a record NZ$381.0 million, 20% above the prior comparable period. Fisher & Paykel Healthcare Corporation Limited (NZX:FPH, ASX:FPH) announced today that it intends to release on Friday, 27 May 2016 its financial results for the year ended 31 March 2016. Following the announcement in August 2015 that Michael Daniell would retire as Managing Director and Chief Executive Officer of Fisher & Paykel Healthcare, the company today advises that Lewis Gradon has now been appointed as Managing Director and Chief Executive Officer, effective 1 April, 2016. Fisher & Paykel Healthcare Corporation Limited attaches a copy of its presentation to analysts and fund managers at the Deutsche Bank / Craigs NZ Companies Day Conference in Sydney. Fisher & Paykel Healthcare Corporation Limited (NZX:FPH, ASX:FPH) advises that the strike price for the dividend reinvestment plan (DRP) operating in respect of the dividend payable on Wednesday 23 December 2015 has been set at NZ$8.4661 per share. Fisher & Paykel Healthcare Corporation Limited (NZSX:FPH, ASX:FPH) announced today that it has selected Nicky Bell as its second participant in the Future Directors programme. Fisher & Paykel Healthcare Chairman Tony Carter was presented with the 2015 Beacon Award by the New Zealand Shareholder’s Association last week. Fisher & Paykel Healthcare Corporation Limited (NZSX:FPH, ASX:FPH) announced today that it intends to release on Friday, 27 November 2015 its financial results for the six months ended 30 September 2015. The release will be issued shortly after 9:00am NZDT, 7:00am AEDT (3:00pm USEST, Thursday, 26 November). Fisher & Paykel Healthcare Corporation Limited (NZSX:FPH, ASX:FPH) will announce today at its investor day in Sydney the introduction of two innovative new products, the F&P EsonTM 2 nasal mask for the treatment of obstructive sleep apnea (OSA) and the F&P HumiGardTM SH870 System for the delivery of warm, humidified CO2 during open and laparoscopic surgery. Fisher & Paykel Healthcare Corporation Limited (NZSX:FPH, ASX:FPH) advises that Scott St John has been appointed as a non-executive director of the company with effect from 1 October 2015. Fisher & Paykel Healthcare Corporation Limited today announced it will hold a technical briefing day for analysts and investors in Sydney on Tuesday 13 October 2015. Fisher & Paykel Healthcare Corporation Limited attaches a copy of its presentation to analysts and fund managers at the Macquarie Australia and New Zealand Corporate Day 2015 in Hong Kong and Singapore and Goldman Sachs Australia and New Zealand Investment Forum in London. Fisher & Paykel Healthcare Corporation Limited (NZSX:FPH, ASX:FPH) advises that all resolutions put to the company’s annual shareholders’ meeting held in Auckland today were passed. Fisher & Paykel Healthcare Corporation Limited (NZSX:FPH, ASX:FPH) has provided the attached Chairman’s speech, CEO’s speech and slide presentation for the 2015 Annual Shareholders’ Meeting. Fisher & Paykel Healthcare Corporation Limited today announced that Managing Director and Chief Executive Officer, Michael Daniell, has advised the company’s board that he intends to retire by the end of the current financial year. He will remain as a director on the Fisher & Paykel Healthcare board. Fisher & Paykel Healthcare Corporation Limited (NZSX:FPH, ASX:FPH) announced today that it has upgraded its earnings guidance for the financial year ending 31 March 2016. Fisher & Paykel Healthcare Corporation Limited (NZSX:FPH, ASX:FPH) has provided a copy of its Notice of Annual Shareholders’ Meeting 2015 which will be held at the Guineas Ballroom, Ellerslie Event Centre, Auckland, New Zealand on Thursday 27 August 2015 commencing at 2.00pm (NZST). Fisher & Paykel Healthcare Corporation Limited (NZSX:FPH, ASX:FPH) advises that the strike price for the dividend reinvestment plan (DRP) operating in respect of the dividend payable on Friday 10 July 2015 has been set at NZ$6.9484 per share. Fisher & Paykel Healthcare Corporation Limited (NZSX:FPH, ASX:FPH) has provided a copy of the following documents: Annual Report for the year ended 31 March 2015; Annual Review for the year ended 31 March 2015; ASX Appendix 4G – Corporate Governance Statement; and Section 209 notice. Fisher & Paykel Healthcare Corporation Limited (NZSX:FPH, ASX:FPH) advises that its 2015 Annual Shareholders’ Meeting will be held at the Guineas Ballroom, Ellerslie Event Centre, Auckland, New Zealand on Thursday 27 August 2015 commencing at 2.00pm (NZST). Fisher & Paykel Healthcare Corporation Limited (NZSX:FPH, ASX:FPH) attaches a copy of its presentation to analysts and fund managers. Fisher & Paykel Healthcare Corporation Limited today reported record net profit after tax of NZ$113.2 million for the full year, an increase of 17% over the prior year. Fisher & Paykel Healthcare Corporation Limited (NZSX:FPH, ASX:FPH) announced today that it intends to release on Friday, 29 May 2015 its financial results for the year ended 31 March 2015. The release will be issued shortly after 9:00am NZST, 7:00am AEST (5:00pm USEDT, Thursday, 28 May). Fisher & Paykel Healthcare Corporation Limited has provided a copy of its Interim Report for the six months ended 30 September 2014. Fisher & Paykel Healthcare Corporation Limited advises that the strike price for the dividend reinvestment plan operating in respect of the dividend payable on Friday 19 December 2014 has been set at NZ$6.0532 per share. Fisher & Paykel Healthcare Corporation Limited today announced record net profit after tax of NZ$48.9 million for the half year, an increase of 10% over the first half last year. Fisher & Paykel Healthcare Corporation Limited announced today that it is supporting the Future Directors initiative, with the appointment of an aspiring director, Franceska Banga, as an observer of Fisher & Paykel Healthcare Board meetings. Auckland, New Zealand, 20 August 2014 - Fisher & Paykel Healthcare Corporation Limited (NZSX:FPH, ASX:FPH) announced today at its annual shareholders’ meeting that it has updated its earnings guidance for the financial year ending 31 March 2015. Fisher & Paykel Healthcare Corporation Limited has provided a copy of its Notice of Annual Shareholders’ Meeting 2014 which will be held at the Guineas Ballroom, Ellerslie Event Centre, Auckland, New Zealand on Wednesday 20 August 2014 commencing at 2.00pm (NZST). Fisher & Paykel Healthcare Corporation Limited (NZSX:FPH, ASX:FPH) has provided a copy of its Annual Report for the year ended 31 March 2014, Annual Review for the year ended 31 March 2014 and a copy of its section 209 notice. Fisher & Paykel Healthcare Corporation Limited advises that its 2014 Annual Shareholders’ Meeting will be held at the Guineas Ballroom, Ellerslie Event Centre, Auckland, New Zealand on Wednesday 20 August 2014 commencing at 2.00pm (NZST). Fisher & Paykel Healthcare Corporation Limited today announced record financial results for the financial year ended 31 March 2014. Fisher & Paykel Healthcare Corporation Limited announced today that it intends to release on Friday, 23 May 2014 its financial results for the year ended 31 March 2014. The release will be issued shortly after 9:00am NZST, 7:00am AEST (5:00pm USEDT, Thursday, 22 May). Fisher & Paykel Healthcare Corporation Limited (NZSX:FPH, ASX:FPH) announced today that it had raised its earnings guidance and will expand its manufacturing facility in Tijuana, Mexico. Fisher & Paykel Healthcare Corporation Limited has provided a copy of its Interim Report for the six months ended 30 September 2013. Fisher & Paykel Healthcare Corporation Limited today reported record net profit after tax of NZ$44.5 million for the six months ended 30 September 2013, an increase of 34% compared to the first half last year. Fisher & Paykel Healthcare Corporation Limited announced today that it intends to release on Friday, 22 November 2013 its financial results for the six months ended 30 September 2013. The release will be issued shortly after 9:00am NZDT, 7:00am AEDT (3:00pm USEST, Thursday, 21 November). Fisher & Paykel Healthcare Corporation Limited (NZSX:FPH, ASX:FPH) announced at its investor day in Sydney today the introduction of the F&P Pilairo™ Q nasal pillows mask for the treatment of obstructive sleep apnea (OSA). Fisher & Paykel Healthcare Corporation Limited advises that Geraldine McBride has been appointed as an additional non-executive director of the company effective 1 August 2013. Fisher & Paykel Healthcare Corporation Limited has provided a copy of its Annual Report for the year ended 31 March 2013, Annual Review for the year ended 31 March 2013 and a copy of its section 209 notice. Fisher & Paykel Healthcare Corporation Limited (NZSX:FPH, ASX:FPH) today reported record net profit after tax of NZ$77.1 million for the year ended 31 March 2013, an increase of 20% compared to the prior year. Full year operating revenue was a record NZ$556.3 million, 8% above the prior year or 11% growth in constant currency. The Prime Minister of New Zealand, the Right Honourable John Key, today officially opened Fisher & Paykel Healthcare's new building in Auckland. Fisher & Paykel Healthcare Corporation Limited announced today that it had raised its earnings guidance and has introduced a new full face mask range for use in the treatment of obstructive sleep apnea (OSA). Fisher & Paykel Healthcare Corporation Limited(NZSX:FPH, ASX:FPH)announced today that it intends to release on Thursday, 22 November 2012 its financial results for the six months ended 30 September 2012. The release will be issued shortly after 9:00am NZDT, 7:00am AEDT (3:00pm USEST, Wednesday 21 November). Fisher & Paykel Healthcare Corporation Limited advise that Donal O’Dwyer has been appointed as an additional non-executive director of the company effective 1 December 2012. 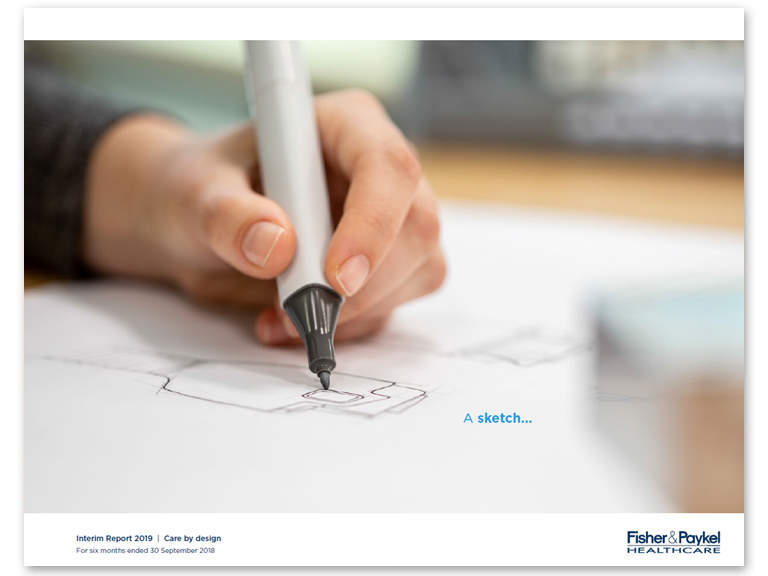 Slides from the Fisher & Paykel Healthcare 2012 Annual Shareholders' Meeting. Fisher & Paykel Healthcare Corporation Limited announced today that it intends to release on Friday, 25 May its financial results for the year ended 31 March 2012. The release will be issued shortly after 9:00am NZST, 7:00am AEST (5:00pm USEDT, Thursday, 24 May). Fisher & Paykel Healthcare Corporation Limited advises that Tony Carter has been appointed Chairman of Fisher & Paykel Healthcare Corporation Limited effective 1 April 2012. As announced at the company's 2011 Annual Shareholders' Meeting, Tony Carter succeeds retiring Chairman Gary Paykel, who will continue to serve as a director of the company. Fisher & Paykel Healthcare Corporation Limited today announced strong sales growth for its respiratory and acute care products (RAC) and its ICON flow generator range used in the treatment of obstructive sleep apnea (OSA). In NZ dollars, operating revenue grew 3%, compared to the same period last year, to a record NZ$252.0 million despite unfavourable exchange rate conditions. Fisher & Paykel Healthcare Corporation Limited announced today that it intends to release, on Wednesday, 23 November 2011, its financial results for the six months ended 30 September 2011. Annual Shareholders' Meeting Slides 2011. In the last financial year we achieved record operating revenue of NZ$506 million. Both our obstructive sleep apnea and respiratory and acute care product groups generated strong sales growth in the fourth quarter, following the launch of our new ICON range, and due to strong demand for our respiratory consumables. Fisher & Paykel Healthcare Corporation Limited advises that the strike price for the dividend reinvestment plan (DRP) operating in respect of the dividend payable on Friday 8 July 2011 has been set at NZ$2.6341 per share. Fisher & Paykel Healthcare Corporation Limited today announced that new products and new clinical applications contributed to accelerating revenue growth late in the year for its respiratory and acute care (RAC) and obstructive sleep apnea (OSA) product groups. Fisher & Paykel Healthcare Corporation Limited announced today that it intends to release on Wednesday, 25 May its financial results for the year ended 31 March 2011. The release will be issued shortly after 9:00am NZST, 7:00am AEST (5:00pm USEDT, Tuesday, 24 May). Fisher & Paykel Healthcare Corporation Limited today announced strong growth in its respiratory and acute care product group and a positive response to its new ICON flow generator range, which is used for the treatment of obstructive sleep apnea (OSA). Operating revenue was NZ$245.0 million for the six months ended 30 September 2010. Fisher & Paykel Healthcare Corporation Limited (NZSX:FPH, ASX:FPH) advises that Tony Carter has been appointed as an independent, non- executive director of the company effective 1 December 2010. Fisher & Paykel Healthcare Corporation Limited announced today that it intends to release on Wednesday, 24 November its financial results for the six months ended 30 September 2010. The release will be issued shortly after 9:00am NZDT, 7:00am AEDT (3:00pm USEST, Tuesday 23 November). Fisher & Paykel Healthcare Corporation Limited announced today that it has awarded the main construction contract for the third building on its Auckland site to Mainzeal Property and Construction Ltd.
We achieved a significant milestone in the 2010 financial year, with our operating revenue exceeding 500 million NZ dollars for the first time. Our growth was again a result of a strong contribution from both of our core product groups. We also achieved strong growth in earnings, with a 15% increase in profit after tax, to 71.6 million New Zealand dollars. Fisher & Paykel Healthcare Corporation Limited (NZSX:FPH, ASX:FPH) today reported a net profit of NZ$71.6 million for the year ended 31 March 2010, an increase of 15% compared to the prior year. Strong growth in its obstructive sleep apnea (OSA) and respiratory and acute care product groups, as well as favourable foreign exchange hedging results, contributed to the result. Fisher & Paykel Healthcare Corporation Limited announced today that it intends to release on Wednesday, 26 May its financial results for the year ended 31 March 2010. The release will be issued shortly after 9:00am NZST, 7:00am AEST (5pm USEST, Tuesday, 25 May). Fisher & Paykel Healthcare Corporation Limited (NZSX:FPH, ASX:FPH) announced today that it has introduced into Australia and New Zealand its new ICON continuous positive airway pressure (CPAP) devices for the treatment of obstructive sleep apnea (OSA). Fisher & Paykel Healthcare Corporation Limited announced today that it intends to invest in a 30,000m2 third building on its East Tamaki, Auckland site to accommodate anticipated growth. Fisher & Paykel Healthcare Corporation Limited announced today that it intends to release on Thursday 19 November its financial results for the six months ended 30 September 2009. The release will be issued shortly after 9:00am NZDT, 7:00am AEDT (3pm USEST, Wednesday 18 November). Fisher & Paykel Healthcare Corporation Limited advises that the Company has reduced its borrowings by NZ$23 million. The Company has taken the opportunity due to the recent strength in the NZD/USD exchange rate to monetise (i.e. close-out) a portion of its USD forward exchange hedge book. Fisher & Paykel Healthcare Corporation Limited is hosting a technical briefing session for analysts and investors today. During the session the company will be discussing the clinical applications of its medical devices, its product technologies and its multiple distribution channels. Fisher & Paykel Healthcare Corporation Limited is pleased to offer its ordinary shareholders residing in New Zealand and Australia the option to participate in a Dividend Reinvestment Plan (DRP). Fisher & Paykel Healthcare Corporation Limited announced today that its operating profit for the year ended 31 March 2009 grew 76%, compared to the prior year, to NZ$102.4 million. Fisher & Paykel Healthcare Corporation Limited (NZSX:FPH, ASX:FPH) announced today that it now intends to release on Tuesday, 26 May its financial results for the year ended 31 March 2009. The release will be issued at approximately 10:00am NZST, 8:00am AEST (6:00pm USEDT, Monday 25 May). Fisher & Paykel Healthcare Corporation Limited today announced a record profit of NZ$37.0 million for the six months ended 30 September 2009, 31% above the prior comparable period. Fisher & Paykel Healthcare Corporation Limited announced today that it intends to release on Wednesday 27 May its financial results for the year ended 31 March 2009. Fisher & Paykel Healthcare Corporation Limited announced today that very strong growth in its respiratory and acute care product group contributed to profit after tax of NZ$28.3 million for the six months ended 30 September 2008, a 51% increase on the same period last year. Fisher & Paykel Healthcare Corporation Limited announced today that it intends to release on Thursday 20 November its financial results for the six months ended 30 September 2008. The release will be issued shortly after 9:00am NZDT, 7:00am AEDT (3:00pm USEST, Wednesday 19 November). Fisher & Paykel Healthcare Corporation Limited announced today that it has further expanded its CPAP flow generator and mask offering for the treatment of obstructive sleep apnea. Around the world an increasing number of hospitals, physicians, nurses, therapists and homecare providers are choosing our medical devices to assist with the treatment of their patients. Fisher & Paykel Healthcare Corporation Limited announced today that continuing strong growth in sales of its respiratory, acute care and obstructive sleep apnea (OSA) products contributed to record operating revenue of NZ$357.9 million or US$271.5 million for the year ended 31 March 2008. Fisher & Paykel Healthcare Corporation Limited announced today that it intends to release on Wednesday 21 May its financial results for the year ended 31 March 2008. The release will be issued shortly after 9:00am NZST, 7:00am AEST (5:00pm USEDT, Tuesday 20 May). Fisher & Paykel Healthcare Corporation Limited today updated its earnings guidance for the year ended 31 March 2008 to reflect the appreciation of the NZD:USD exchange rate and trading over the past six months. Fisher & Paykel Healthcare Corporation Limited advises that our Australia based Director Adrienne Clarke, has tendered her resignation to the Board after six years as a Director. Fisher & Paykel Healthcare Corporation Limited announced today that continuing strong volume growth in its obstructive sleep apnea (OSA), respiratory and acute care products contributed to operating revenue of NZ$172.5 million or US$127.7 million for six months ended 30 September 2007. Fisher & Paykel Healthcare Corporation Limited announced today that it intends to release on Thursday 22 November its financial results for the six months ended 30 September 2007. The release will be issued shortly after 9:00am NZDT, 7:00am AEDT (3:00pm USEST, Wednesday 21 November). Fisher & Paykel Healthcare Corporation Limited announced today that it has introduced at Worldsleep07 in Cairns, Australia the first of a range of innovative ‘smart’ flow generators which are intended for use in the treatment of obstructive sleep apnea (OSA). At a time when many exporters from New Zealand have been under considerable pressure, it is pleasing to be able to report that your company, which earns almost all of its revenue internationally, achieved record trading revenue of 349 million New Zealand dollars for the year to 31 March 2007. Fisher & Paykel Healthcare Corporation Limited announced today that 27% revenue growth from its obstructive sleep apnea (OSA) product group contributed to record trading revenue of NZ$349.2 million for the year ended 31 March 2007. Fisher & Paykel Healthcare Corporation Limited today reaffirmed its earnings guidance for the year ending 31 March 2007 and updated its operating profit expectation to reflect the appreciation of the NZD:USD exchange rate. Fisher & Paykel Healthcare Corporation Limited advises that its US operating company, Fisher & Paykel Healthcare Inc., has received a warning letter from the United States Food and Drug Administration (FDA). Fisher & Paykel Healthcare has become aware that a connector component used in a previous version of its Continuous Positive Airway Pressure (CPAP) masks may fail prematurely if improperly cleaned. Fisher & Paykel Healthcare Corporation Limited today reported record trading revenue of NZ$173.2 million for the six months ended 30 September 2006, up 28% against the prior comparable period. Fisher & Paykel Healthcare Corporation Limited announced today that it intends to release on Wednesday 1 November its financial results for the six months ended 30 September 2006. The release will be issued shortly after 9:00am NZDT, 7:00am AEDT (3:00pm USEST, Tuesday 31 October). In our annual report to you this year, we summed up our performance in four words – more patients, more places. That’s a brief description of a very positive year for us, in which we made excellent progress in our goal to grow the business by serving a much broader range of patients and by extending our geographic reach. Fisher & Paykel Healthcare Corporation Limited (NZSX:FPH, ASX:FPH) announced today that 53% trading revenue growth, in US dollar terms for CPAP flow generators and masks, contributed to a record operating profit of NZ$104.1 million. Fisher & Paykel Healthcare Corporation Limited (NZSX:FPH, ASX:FPH) announced today that it has begun to introduce an extensive range of new respiratory interfaces to its international markets. Fisher & Paykel Healthcare Corporation Limited announced today that it intends to release on Thursday 25 May its full year results for the year ended 31 March 2006. The release will be issued shortly after 9:00am NZST, 7:00am AEST (5:00pm USEDT, Wed 24 May). Fisher & Paykel Healthcare Corporation Limited announced today that 42% OSA product group revenue growth, in US dollar terms, contributed to a 14% increase in first half operating profit to a record NZ$47.4 million. Fisher & Paykel Healthcare Corporation Limited announced today that it intends to release on Thursday 17 November its results for the six months ended 30 September 2005. The release will be issued shortly after 9:00am NZDT, 7:00am AEDT (3 pm USEST, Wed 16 Nov). Fisher & Paykel Healthcare Corporation Limited announced today that it continues to expand the range and application of its respiratory masks with the introduction of four new mask models. If I could sum up the year in one word, it would be “expansion”. We have profitably expanded our range of products in each of our product groups and our share in each of the markets we operate in. We have expanded into new categories of patient care. Fisher & Paykel Healthcare Corporation Limited today announced record revenue for the year ended 31 March 2005 and a 14% increase in operating profit to NZ$89.7 million. Fisher & Paykel Healthcare Corporation Limited announced today that it has developed a new respiratory humidification system which the company believes could significantly increase demand for its technology in the future. Fisher & Paykel Healthcare Corporation Limited announced today that ongoing growth from new products has contributed to record operating profit and a higher interim dividend. Fisher & Paykel Healthcare Corporation Limited (NZX:FPH, ASX:FPH) announced today that it intends to release on Wednesday 10 November its results for the six months ended 30 September 2004. The release will be issued shortly after 9:00 NZDT, 7:00 AEDT (3pm USEST, Tuesday 9 November 2004). Fisher & Paykel Healthcare Corporation Limited announced today that it has further extended its range of masks for use in the treatment of Obstructive Sleep Apnea (OSA). The company will introduce the latest additions to its range at the Medtrade exhibition in Orlando, Florida which opens on 26 October. Fisher & Paykel Healthcare Corporation Limited (NZX:FPH, ASX:FPH) advises that the Board has resolved to subdivide the Company’s existing ordinary shares. Each one existing ordinary share in the Company will be subdivided into five ordinary shares. The Board considers that the subdivision will provide additional liquidity in the market for the Company’s shares. Fisher & Paykel Healthcare Corporation Limited (NZX:FPH, ASX:FPH) announced today that it has introduced a range of innovative flow generators which are intended for use in the treatment of obstructive sleep apnea (OSA). This is a special year for us, for while Fisher & Paykel Healthcare is a relative youngster as a separate listed company, in 2004 we are celebrating the 70th anniversary of the founding of Fisher & Paykel, and almost 35 years since the development of our first medical product. Fisher & Paykel Healthcare Corporation Limited (NZX:FPH, ASX:FPH) announced today that it had begun pilot marketing, in New Zealand and Australia, an innovative humidification system for use in the rapidly growing field of laparoscopic surgery. Fisher & Paykel Healthcare announced today that it has expanded its operations in Asia with the establishment of a company in Japan, Fisher & Paykel Healthcare KK, and the opening of a sales and marketing support office in Tokyo. Fisher & Paykel Healthcare Corporation Limited announced today that growth from new products contributed to the company achieving record revenue of NZ$214.9 million and an increased operating profit of NZ$79.0 million for the twelve months ended 31 March 2004. Fisher & Paykel Healthcare Corporation Limited announced today that it has introduced a full face mask to the range of masks it offers for use in the treatment of Obstructive Sleep Apnea (OSA). The new mask, which received United States FDA 510(k) clearance this week, will be aimed at the premium end of the market in the United States and international markets. Fisher & Paykel Healthcare Corporation Limited announced today that it will provide one million NZ dollars in sponsorship towards the development of a clinical education centre at the new Auckland City Hospital. The centre will be named the Fisher & Paykel Healthcare Clinical Education Centre and will serve as a world-class regional facility for clinical education, training and conferences. Fisher & Paykel Healthcare Corporation Limited (NZX:FPH ASX:FPH) announced today that it intends to release on Thursday 20 May 2004 its fiscal 2004 full year results for the period ended 31 March 2004. The results release will be issued shortly after 9am NZST, 7am AEST (5pm, Wednesday 19 May 2004 USEDT). Fisher & Paykel Healthcare Corporation Limited announced today that it is introducing revolutionary new breathing circuit technology into its international markets. Introduction in the United States is expected to follow once FDA clearance has been obtained. Fisher & Paykel Healthcare Corporation Limited (NZX:FPH, ASX:FPH) announced today that it intends to undertake an on-market share buy back programme of up to NZ$27.5 million. Fisher & Paykel Healthcare Corporation Limited announced today that it is expanding its range of nasal masks sold in the United States and internationally, with a new product aimed at the premium end of the market. Fisher & Paykel Healthcare Corporation Limited welcomes its new shareholders following Fisher & Paykel Appliances Holdings Limited’s placement of its 19.34% shareholding in the company. Fisher & Paykel Healthcare Corporation Limited (NZX:FPH, ASX, FPH) has today been advised by Fisher & Paykel Appliances Holdings Limited (FPA) that FPA has successfully completed the bookbuild process in respect of the sale of its 19.34% shareholding in Fisher & Paykel Healthcare Corporation Limited. Fisher & Paykel Healthcare Corporation Limited today updated its revenue guidance for the year ending 31 March 2004 to allow for exchange rate movements. Fisher & Paykel Healthcare Corporation Limited has today been advised by Fisher & Paykel Appliances Holdings Limited that Fisher & Paykel Appliances Holdings Limited has determined to undertake the sale of its shareholding in Fisher & Paykel Healthcare Corporation Limited today. In view of this, the Company has sought a temporary trading halt in respect of its shares from NZX and ASX. Fisher & Paykel Healthcare announced today that it has signed a shared primary purchasing agreement with Apria Healthcare Group Inc. The United States’ largest provider of home healthcare services. 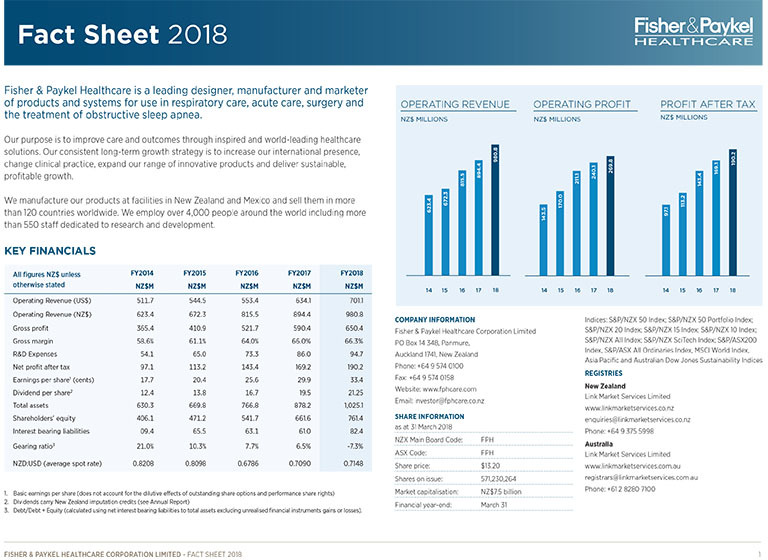 Revenue growth from new products contributed to Fisher & Paykel Healthcare Corporation Limited’s record first half revenue of NZ$104.9 million and an increased operating profit of NZ$37.0 million for the six months ended 30 September 2003. Fisher & Paykel Healthcare Corporation Limited (NZX:FPH. ASX:FPH) announced today that it intends to release on Tuesday 11 November its results for the six months ended 30 September 2003. Fisher & Paykel Healthcare Corporation Limited announced today that it will introduce the latest addition to its range of nasal masks at the European Respiratory Society (ERS) meeting which will be held from 27 September to 1 October in Vienna. When we met last year, I made the observation that our company is a true knowledge- based business, one of those that fits the model we hear talked about so often under the banner of “knowledge economy”. You will be very familiar with this often-used term. The thinking behind it is that New Zealand’s economic performance will lift markedly if we increase our earnings from companies who deal in the fruits of intellectual property and research. Fisher & Paykel Healthcare Corporation Limited announced today that it had received United States FDA clearance for its neonatal breathing circuits, which are used in conjunction with the company’s MR850 respiratory humidifier system. Fisher & Paykel Healthcare Corporation Limited announced today that it had been granted a health insurance reimbursement code in Germany for its HC221 integrated flow generator-humidifier which is used for the treatment of Obstructive Sleep Apnea (OSA). Fisher & Paykel Healthcare Corporation Limited announced that today it introduced the latest additions to its range of flow generators at the Associated Professional Sleep Societies meeting in Chicago. Fisher & Paykel Healthcare Corporation Limited today announced a record profit from continuing operations of NZ$72.9 million after-tax for the financial year ended 31 March 2003. Revenue for the year grew 15%, in US dollar terms, compared with the prior year. ResMed Inc. (NYSE: RMD) and Fisher & Paykel Healthcare Corporation Limited (NZSE: FPH, ASX: FPH) announced that they have settled the patent infringement lawsuit ResMed filed against Fisher & Paykel over Fisher & Paykel’s Aclaim mask products, used in the treatment of sleep-disordered breathing. Fisher & Paykel Healthcare Corporation Limited (NZSE:FPH. ASX:FPH) ), announced today that it intends to release on Thursday 22 May 2003 its fiscal 2003 full year results for the period ended 31 March 2003. The results release will be issued shortly after 8.30am NZT, 6.30am AEST (4.30pm, Wednesday 21 May 2003 USEST). Fisher & Paykel Healthcare announced today that it has begun direct sales operations in Italy and Spain as it continues its strategy to operate with its own sales staff in key markets. Fisher & Paykel Healthcare Corporation Limited advises that 5,040 ordinary shares in the company were issued on 19 March 2003 to the trustees of the Fisher & Paykel Healthcare Australian Employee Share Scheme (the Scheme), to be held on trust for those employees accepting an offer to participate in the the Scheme following approval by the Board on 5 March 2003. Fisher & Paykel Healthcare Corporation Limited announced today that its American Depositary Receipt (ADR) programme and quotation of its American Depository Shares on the Nasdaq National Market will terminate at the close of business on 28 February 2003 (New York time). Fisher & Paykel Healthcare Corporation Limited today announced a record third quarter, with profit from continuing operations of NZ$26.2 million for the three months ended 31 December 2002. Revenue for the three months grew 17% in US dollar terms, compared with the prior comparable quarter in 2001. Interim Report for Fisher & Paykel Healthcare for the 2019 financial year. A short overview of Fisher & Paykel Healthcare's history, financial performance, business areas and management team. Shareholders should address questions relating to dividends, certificates or changes of address to Fisher & Paykel Healthcare's share registrar, Link Market Services Limited. Sign up to receive email notifications of the latest investor news from Fisher & Paykel Healthcare.